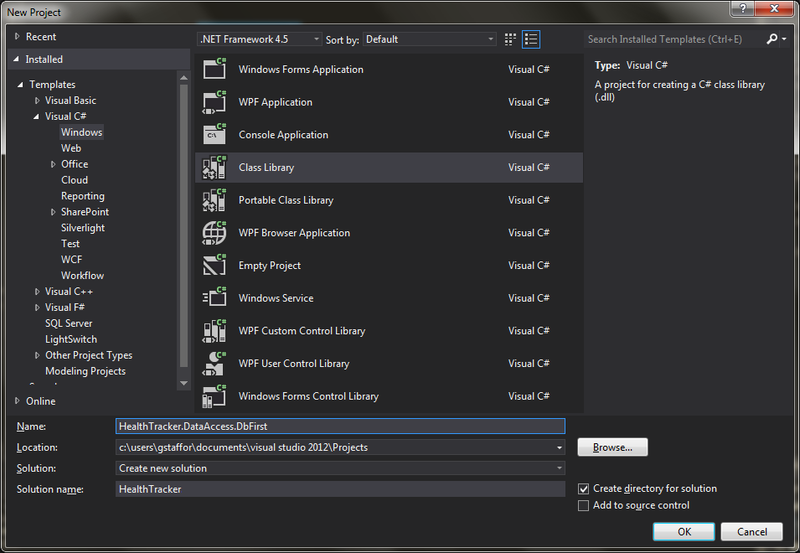 Build and test a Data Access Layer (DAL) using Entity Framework 5 and Database First Development in Visual Studio 2012. 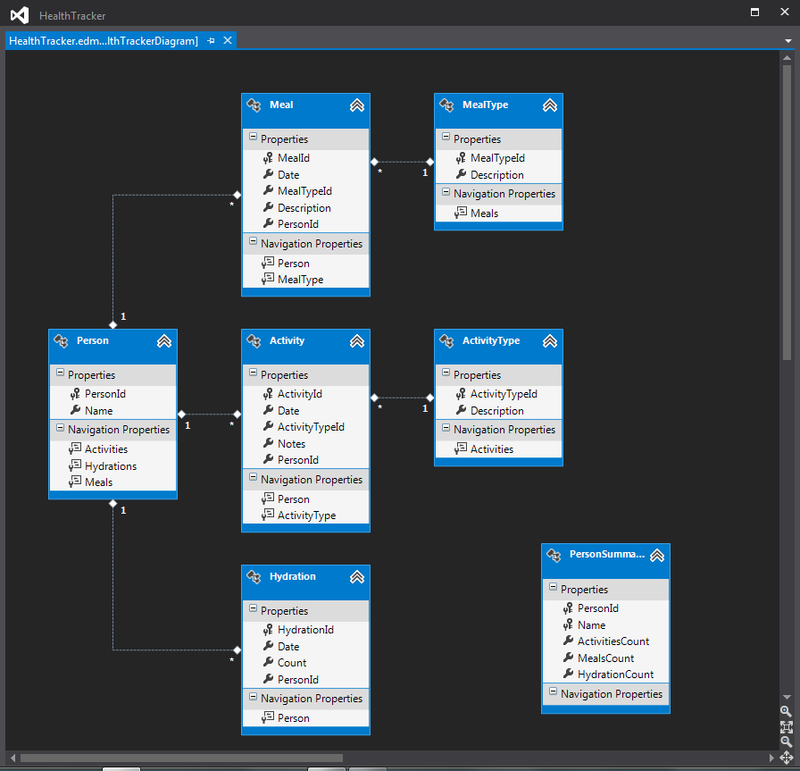 Use the Entity Framework Designer to build an ADO.NET Entity Data Model containing database tables, views, stored procedures, and scalar-valued functions. An updated version of this project’s source code, using EF6 is now available on GitHub. The GitHub repository contains all three Entity Framework blog posts. 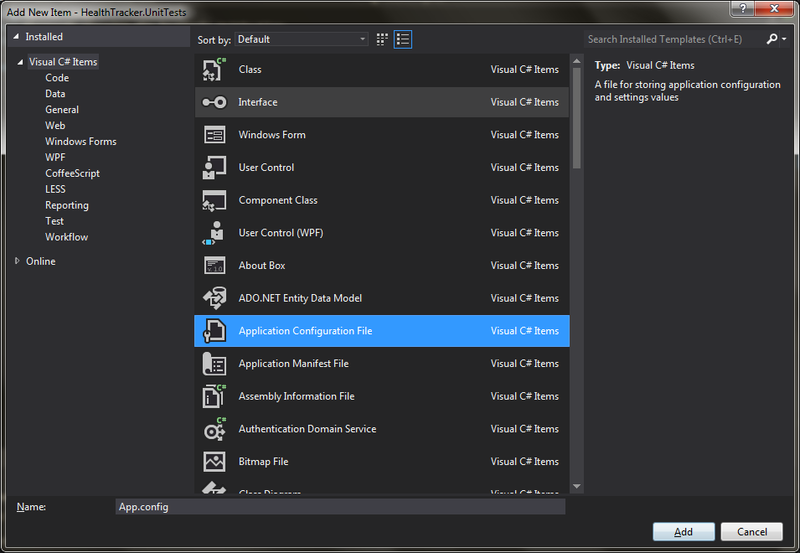 In the last post, we explored Microsoft’s new Entity Framework 5 with Code First Development. 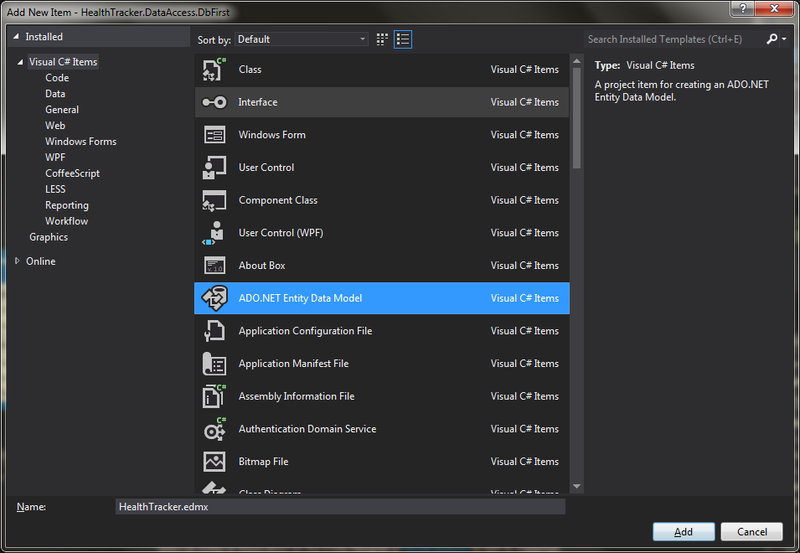 In this post, we will explore Entity Framework 5 with Database First Development. We will be using the same data model as before. However, this time instead of POCOs, we will start with a SQL Server 2008 R2 database and use the Entity Framework Designer to build an ADO.NET Entity Data Model (EDM). In addition to database tables, we will look at Entity Framework’s ability to support database views (virtual tables), stored procedures, and scalar-valued functions. Download a complete copy of the post’s source code, with SQL scripts to create the database objects and populate the database with sample data, from DropBox. Entity Framework’s Code First and Model First development offer many great options for .NET developers. However, in my experience, most enterprise-level application developers work with a Database First Development model. Using Database First Development, Entity Framework 5 (EF5) provides the ability to construct a powerful yet easy-to-implement data access layer (DAL) between the database and the business logic. Below is a final view of the entire Solution for reference as you work through the post. 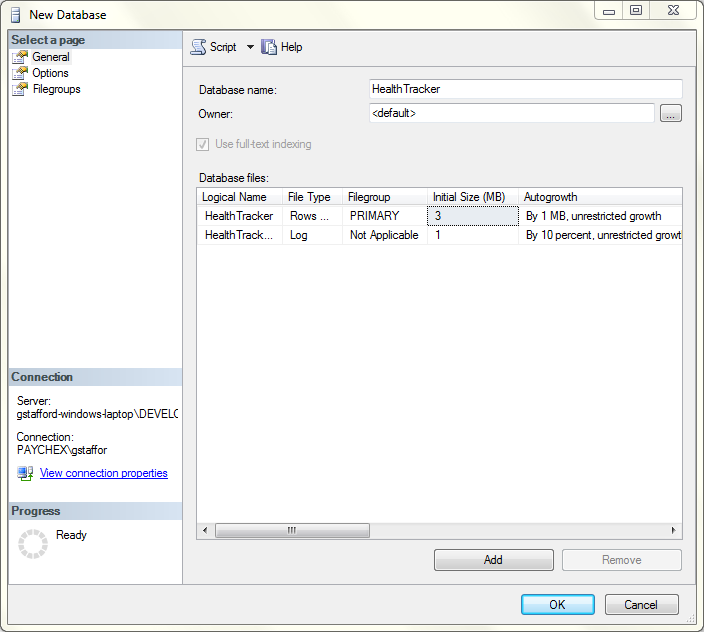 Using SQL Server 2008 R2 Management Studio (SSMS), Toad for SQL, or similar application, create a new database, named ‘HealthTracker’. I left all the default database settings unchanged for this post. 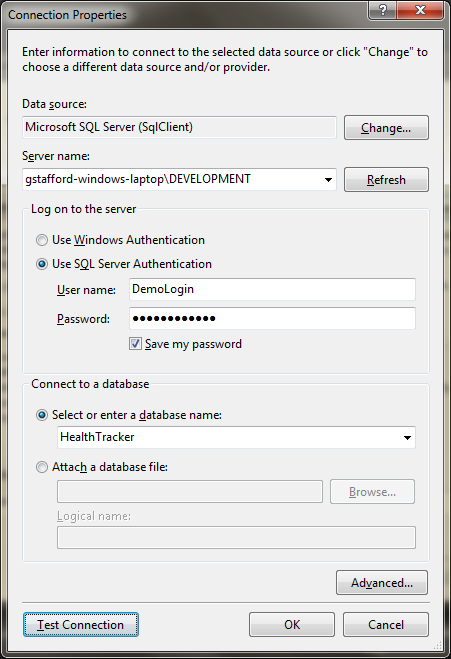 Next, execute the supplied sql script to populate the HealthTracker database with the necessary database objects. The script should insert the following objects: (6) tables, (1) view, (1) stored procedure, (3) scalar-valued functions, and all the necessary table relationships. All objects will be members of the default ‘dbo’ schema. Barring a few minor changes, this data model is identical to the one we built in the last post using Code First Development with POCOs. The below Database Diagram illustrates the one-to-many relationships between the tables. 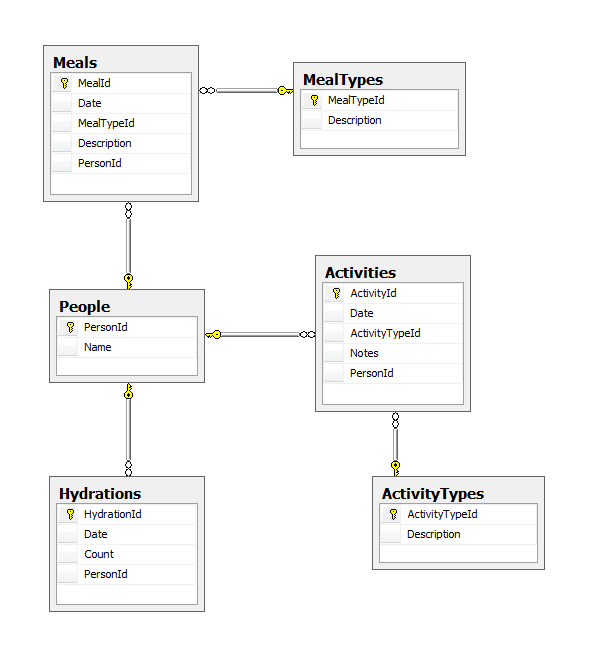 The tables are pluralized in the database, as opposed to singular in the ADO.NET Entity Data Model (Meals vs. Meal, People vs. Person, etc.). This is a common pattern with Entity Framework. For security and simplicity, I choose to add a new Login, User, and Role to the database. This step is not necessary for this post. However, it is good to get into the habit of securing your database, using database Logins, Users, Roles, and Permissions. In addition, if you are planning to deploy the database and the DAL to other environments such as Test or Production, don’t tie your Solution to personal credentials, a machine-specific account, or to an administrative role in the database with overly broad permissions. The Database User, DemoUser, is associated with the Login, DemoLogin. DemoUser is a member of the Database Role, DemoRole. I will use the DemoLogin account to connect the EDM to the database. 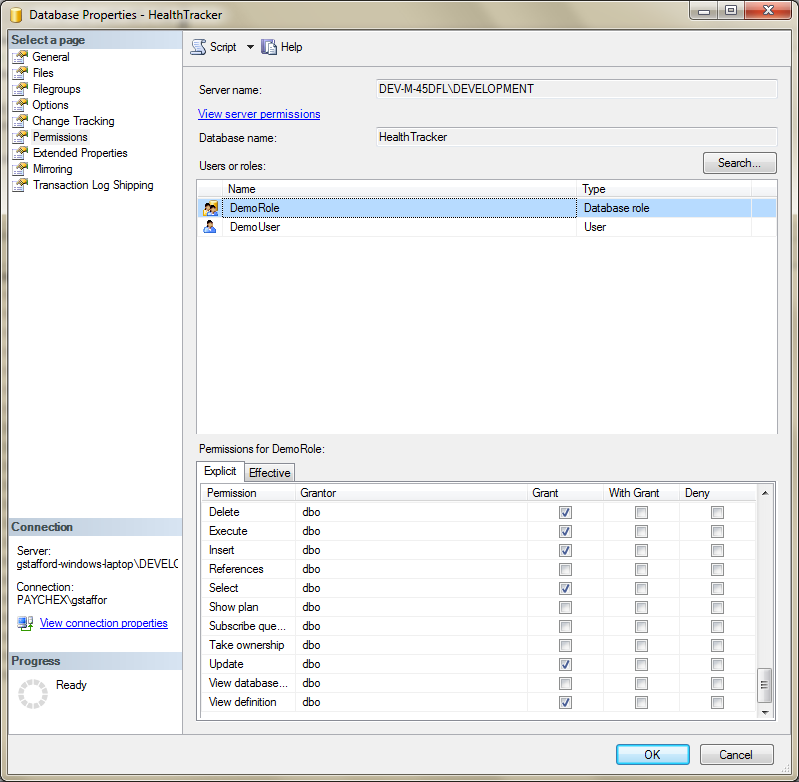 DemoRole has the minimal required database permissions the Entity will need to function: Alter, Insert, Delete, Execute, Select, Update, and View definition. DemoUser only needs Connect permission. Again, this step is optional. You can use your own credentials if you choose. Included with the downloadable code is a third sql script that should create the User, Role, Login, and required Permissions, if you choose to use them to follow along with the post. Following good software design principles, we will separate our concerns between Projects. We want to create a Data Access Layer (DAL), to act as an interface between our database and our business logic. We don’t want to interact with the data directly in our DAL Project. By separating the DAL into its own project, we can reference that project’s assembly (.dll) from any other project, be it another class library (our business logic), a WCF service, WPF, Silverlight or console application, or an ASP.NET site. To start, create a new Visual C# Class Library. Name it ‘HealthTracker.DataAccess.DbFirst’. Create a new Solution for the Project in the same dialog box, named ‘HealthTracker’. First, install Entity Framework (System.Data.Entity namespace classes) into the Solution by right clicking on the Solution and selecting ‘Manage NuGet Packages for Solution…’. Install the ‘EntityFramework’ package. 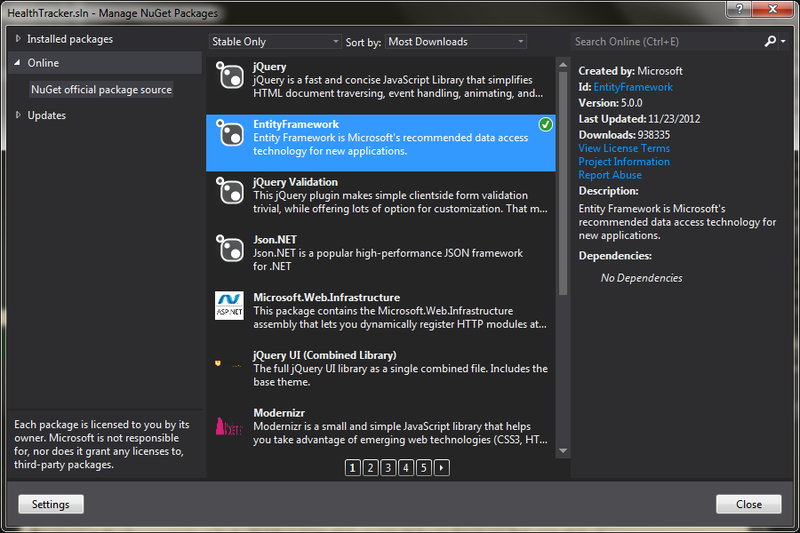 If you haven’t discovered the power of NuGet with Visual Studio, check out their site. 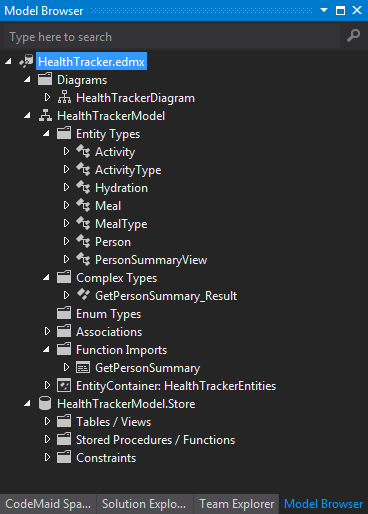 Next, add a new ‘ADO.NET Entity Data Model’ item, named ‘HealthTracker.edmx’, to the HealthTracker.DataAccess.DbFirst project. 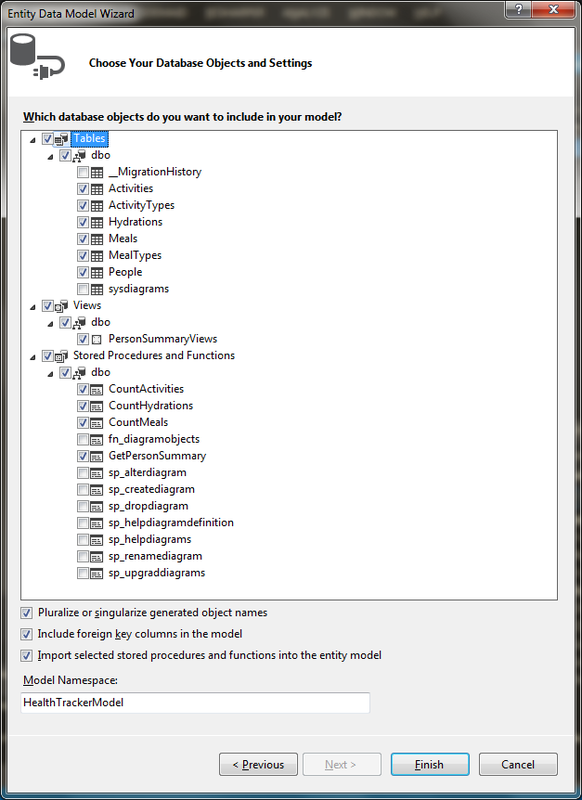 According to Microsoft, an .edmx file also contains information used by the ADO.NET Entity Data Model Designer (Entity Designer) to render a model graphically. An .edmx file is the combination of three metadata files: the conceptual schema definition language (CSDL), store schema definition language (SSDL), and mapping specification language (MSL) files. For more information, see .edmx File Overview (Entity Framework). 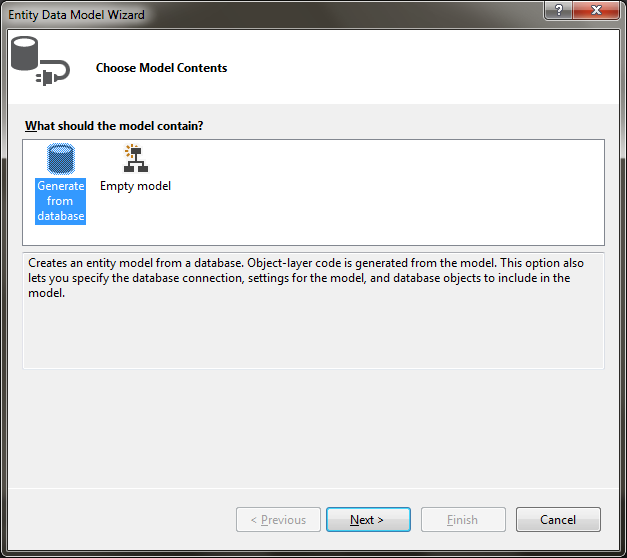 Adding the ADO.NET Entity Data Model item will start the Entity Data Model Wizard. Since we are exploring Database First Development, select ‘Generate from Database’. The options you chose in the ‘Connection Properties’ dialog window, such as the server and instance name, will depend on your own SQL Server configuration and the method you chose to log onto the server. As mentioned before, I will use the ‘DemoLogin’ account. The connection string will reside in the project’s app.config file. Make sure to always chose ‘Test Connection’ to verify you have configured the Data Connection properly. Once the data connection is established, we are prompted to add the database objects to the EDM. Only add the objects that we created earlier with the sql script. When the import is complete, the EDM should look like the following in the Entity Designer. You should see the six table entities, with one-to-many associations between them, as well as the one view entity, ‘PersonSummaryView’. Each database object you imported is referred to as an entity. Drag the entities into any position you want on the Design surface. Similarly, when the import is complete, the EDM should look like the following in the Model Browser. You recall we imported a stored procedure, ‘GetPersonSummary’. What happened to that object? In the Model Browser, double-click on the GetPersonSummary item under the Function Imports. The stored procedure was imported into the EDM by EF. 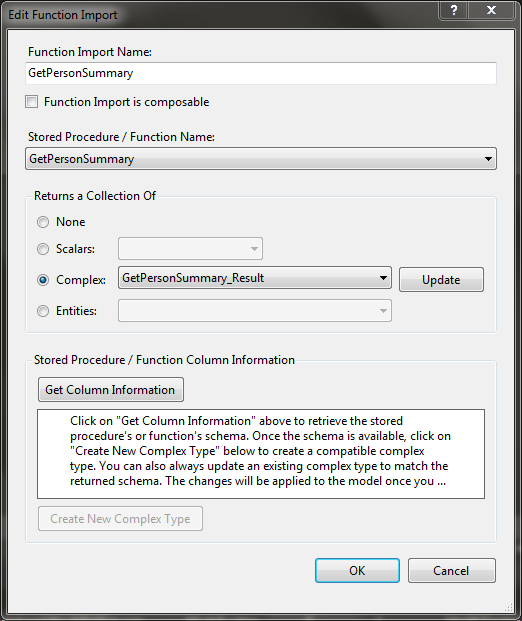 The results the procedure returns from the database is associated with a new complex object type, ‘GetPersonSummary_Result’. If you view the sql code for the above stored procedure, ‘GetPersonSummary’, you will note it calls three scalar-valued functions. These three happen to be the three functions we imported into the EDM. Each function takes a single input parameter, ‘personId’, and returns an integer value – the count of Meals, Activities, and Hydrations for a that Person, based on their Id. We can also call the scalar-valued functions directly. Unfortunately, in my experience, working scalar-valued functions in Entity Framework is still not as easy as tables, views, and stored procedures. I have found two methods to work with scalar-valued functions. The first method is a bit of hack in my opinion, but it works. The method is documented in several Internet posts, including this one on Stack Overflow. Remove the ‘ReturnType’ attribute from the <Function /> element. Then, add a <CommandText /> element to each of the <Function /> elements. See the modified .edmx file below for the contents of the <CommandText /> elements. You can do the same for the other two scalar-valued functions, if you choose. We will only test the ‘CountActivities’ function, next with our Unit Tests. The downside of this method is the edits to the .edmx file will be lost when you update the EDM from the database. You will have to re-edit the .edmx file each time. This not a great solution. The second method to call a scalar-valued function uses a feature of Entity Framework 5, the ‘Database.SqlQuery Method (String, Object)’ Method. According to Microsoft, an instance of this class is obtained from an DbContext object and can be used to manage the actual database backing a DbContext or connection. Using ‘SqlQuery’ method, a raw SQL query that will return elements of the given generic type is created. The type can be any type that has properties that match the names of the columns returned from the query, or can be a simple primitive type. Below is an example of the method’s use, similar to code in the Unit Test Project we will create next, to test our EDM. This method allows us to call the scalar-valued function directly from the database, just as we could any other object using a sql query. The downside of this method is that we are not really taking advantage of the EDM we constructed. It is easier than the first method and it doesn’t need continued changes if we update the EDM. Undoubtedly, there are better methods out there than I have presented here. To confirm that the EDM is functioning properly, we will create and execute a series of Unit Tests. In reality, although we will be using Visual Studio’s Unit Test Project type, the tests are more like functional tests than true unit tests. This is especially true because we are writing the tests after we have completed development our DAL’s EDM. We will perform minimal testing of the EDM’s tables, view, stored procedure, and scalar-valued functions, with a series of several simple tests. The tests are only meant to demonstrate the type of tests you could use across all entities in the Model to confirm various functions. 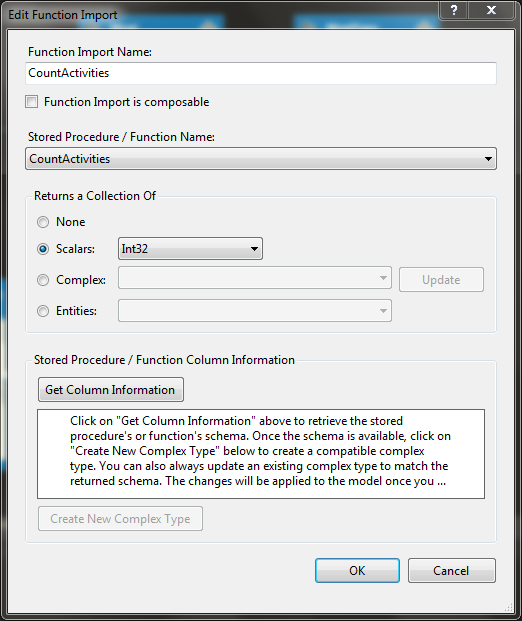 In SSMS or VS2012, execute the supplied sql script that populates the database with test data. The script contains a variety of Meal Types, Activity Types, People, Meals, Activities, and Hydrations table records. Note the script deletes all existing data from those tables. 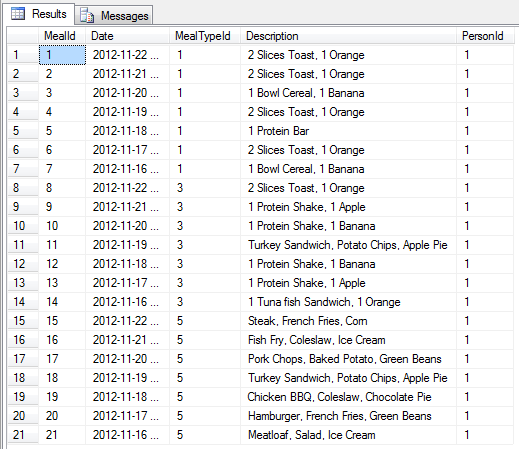 Below is a sample of the Meal table’s sample data. 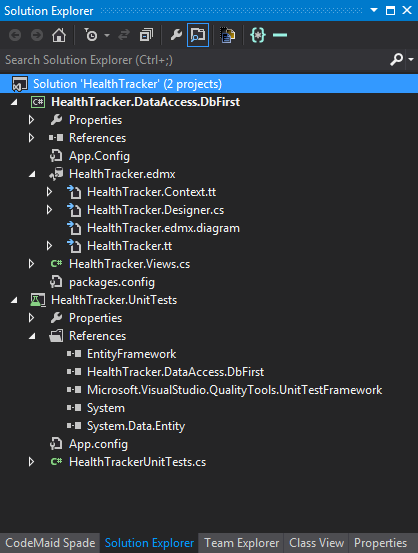 After adding the sample data to the HealthTracker database, add a new Visual Studio 2012 Unit Test Project, named ‘HealthTracker.UnitTests’, to the ‘HealthTracker’ Solution. Next, add a Reference to the Unit Test Project from our DAL, the ‘HealthTracker.DataAccess.DbFirst’ Project. 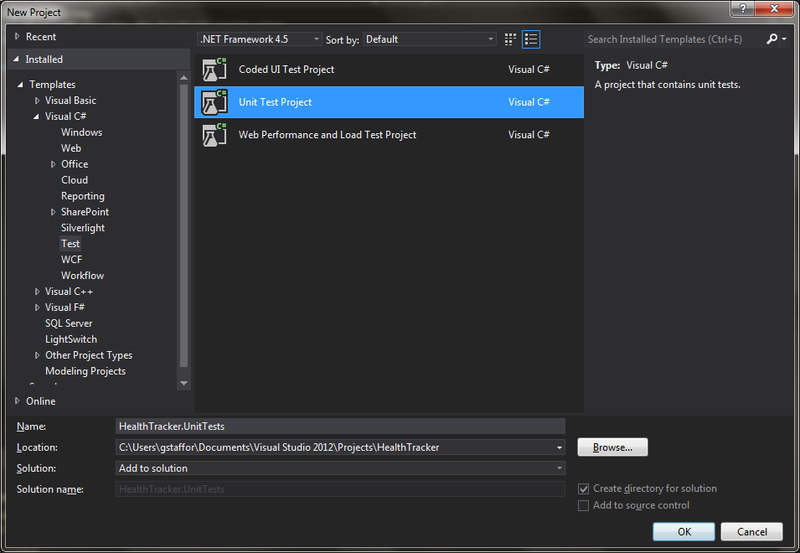 This step adds the ‘HealthTracker.DataAccess.DbFirst.dll’ assembly to our Unit Test Project. Next, we need to add the same Database Connection we used in the ‘HealthTracker.DataAccess.DbFirst’ Project, to this Project. I always forget this step and end up with a database connection error the first time I try to run a new project. Right-click on the Unit Test Project and select ‘Add New Item…’ Add an ‘Application Configuration File’ item, named ‘app.config’, to the Unit Test Project. 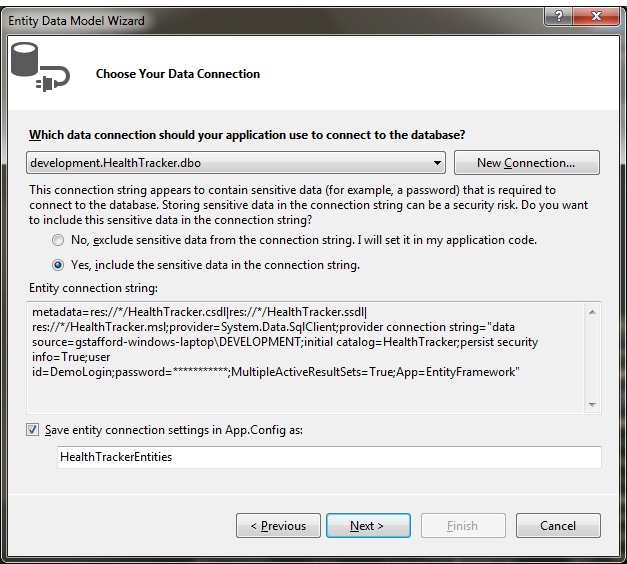 Open the corresponding Application Configuration File in the ‘HealthTracker.DataAccess.DbFirst’ Project and copy the <connectionStrings /> element to our Unit Test Project’s app.config file. The file’s contents should look similar to the following when complete (note, your ‘connectionString’ attribute will have different values). Lastly, rename the default ‘UnitTest’ class in the Unit Test Project to ‘HealthTrackerUnitTests’. Enter or copy and paste the contents of the supplied HealthTrackerUnitTests.cs file to this file. The supplied file contains all the unit tests. /// Return the count of People in the database, which should be 4. /// Return the PersonId of 'John Doe', which should be is 1. /// Insert a new Person into the database. /// Update a Person's name in the database. /// Return the Meal count from PersonSummaryViews database view, which should be 21. /// Call CountActivities scalar-valued function directly from in the database. /// Call CountActivities scalar-valued function from the Entity Data Model. When complete, build the Solution. 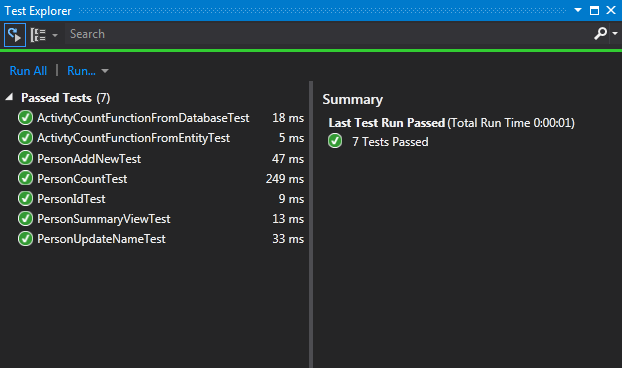 Then finally, from the Test menu in the top Visual Studio menu bar, or by right clicking on the ‘HealthTrackerUnitTests’, run all Unit Tests. The test results should look like the following. Congratulations, we have built and tested a Data Access Layer using Entity Framework 5. The DAL can now be referenced from a middle-tier business assemble, WCF Service, or directly from a client application. This entry was posted on November 22, 2012, 10:36 pm and is filed under .NET Development, Software Development. You can follow any responses to this entry through RSS 2.0. You can leave a response, or trackback from your own site. The problem was related to some referece files missing, like EntityFramework.dll, System.Data.Entity and also, the using statement at the beggining of the class pointing to the System.Data.Entity namespace. I call this as Awesome ! Cheers ! That is explained in post. It discusses how to import functions. Hey Gary, Great post. However, your work around for Importing Scalar functions did not work for me. Kept getting a ReturnType required message, edmx xml was not well formed and hence could not load the model view to continue. Any ideas? Any luck? I am also seeing that the XML was not well formed after I removed the “ReturnType”. Hello to all my brother.pls i’m new to restful web service and also new in using the new apache TomeePlus .My aim of using restful webservice is to integrate it in my web e-comerce websit. In my sql ,I built a database called oko which is made up on table with ID,firstname and Lastname, this is just for testing purposes. i used glassfish server 3.2.
when i tested the restful webservice it work pretty well. i was very happy with this !!. but it is not working . it gave my an error which has kept me one week trying to resolve. .Please brothers this has kept me almost a week of nigthless sleep. i need your help and support pleas. Hello Mr Gary A.i am Bartholomew from Nigeria. i’m new to restful web service and also new in using the new apache TomeePlus .My aim of using restful webservice is to integrate it in my web e-comerce websit. In my sql ,I built a database called oko which is made up of a table okolo ,with ID,firstname and Lastname as columns, this is just for testing purposes. it gave me an error which has kept me one week trying to resolve. Thank you for the fantastically thorough post! You are to be commended. I have an issue, however, that I hope you can help me get past. 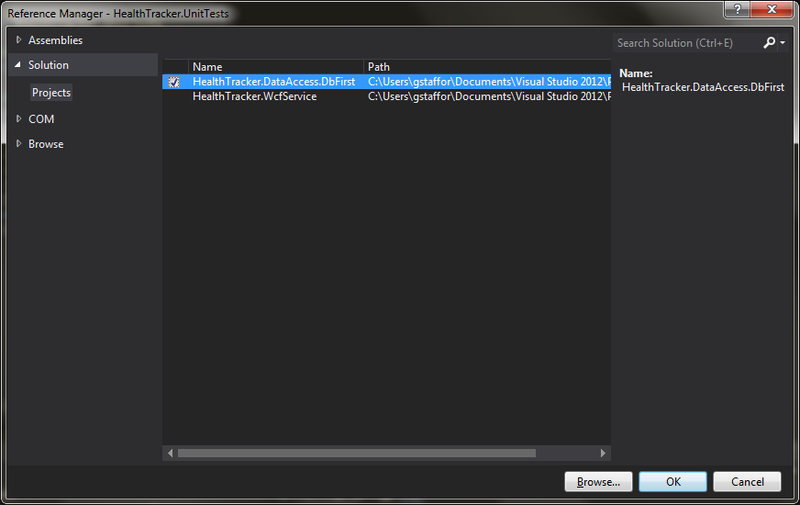 I have created the empty HealthTracker database in SQL 2012. 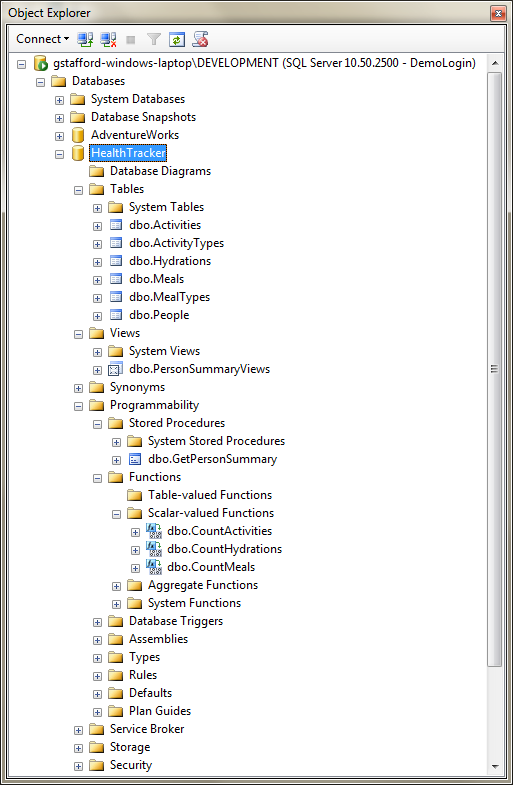 When I run the Health_Tracker_Create_All_Objects script, SSMS complains that Database ‘$(DatabaseName)’ does not exist. Make sure that the name is entered correctly. Should something be substituted for DatabaseName? What are the implications of this error? To allow for executing in sqlcmd mode – select the “Query” menu and select “SQLCMD mode”. the line above should then have grey highlight over it. How do I read the Entity Framework Model and validate it against a given connection? I want to ensure the model matches the database after a migration. but I don’t want to execute the stored procedures, just validate they exist.